Odos Imaging has won the Vision Award 2014. The Scottish-based company’s 3D imaging time-of-flight system won out over five other shortlisted entries. Imaging and Machine Vision Europe (IMVE) sponsors the €5,000 prize and Warren Clark, IMVE's publishing director, presented the award to Chris Yates, CEO of Odos at the Vision Show in Stuttgart on 4 November. Odos Imaging’s 3D systems are based on pulsed time-of-flight technology. The current model is the Real.iZ-1K (1.3 megapixel), with the Real.iZ-4K (4.2 megapixel) due to be released in 2015. Each pixel making up the sensor can be used to measure both ambient light and range, allowing the systems to generate separate images of the scene in both range and intensity modes. The system includes all the features of a conventional machine vision camera, with the additional benefit of individual pixel range measurements. Time-of-flight works by measuring the time taken for light to travel from the source, be reflected by an obstruction, and return to a sensor. This is used to calculate the distance from the device. Yates said that while many products have been developed for a wide variety of applications using this principle, the results obtained are typically single-point measurements, and often provide a series of distance slices similar to that of a laser scanner. In contrast, Odos’ system, the Real.iZ VS-1000, collects a complete image of the scene in front of it. By using pulsed light which illuminates the entire scene, the company was free to use relatively simple pixels for the sensor. This means both range and intensity images can be created, as Yates explained: ‘Smaller pixels allow higher-resolution image sensors suitable for 3D imaging to be designed and fabricated. At the same time, a more conventional pixel design provides the possibility to operate as a standard machine-vision camera and capture intensity images. 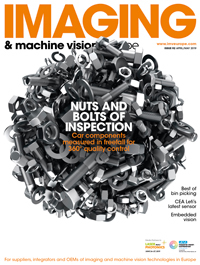 ‘This new capability opens the door to new applications for machine vision. Neither the range nor the intensity image is primary; either or both can be used depending on the application requirements.’ For example, the range image can be used to simply remove the background of an intensity image beyond a certain distance as a means of effective image segmentation. Odos Imaging is a venture-backed spin-out from the Siemens Technology Accelerator in Munich, originally started to commercialise 3D imaging techniques.